Tiger Woods has revealed he had a follow-up procedure on Wednesday to relieve discomfort which resulted from his back surgery in September. The statement on his website added that there was "no timetable" for the return of the 39-year-old American, who has won 14 majors. 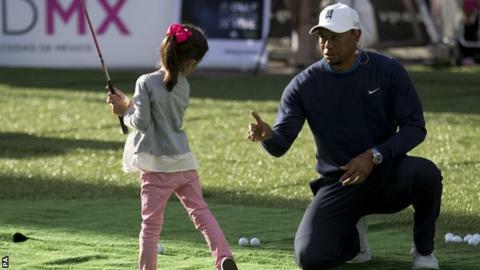 "It's one of those things that had to be done," said Woods, who has dropped from world number one to 351. "I have an outstanding team of doctors, and I'll be back as soon as I can." He is currently on bed rest and will miss a planned 5 November visit to the Bluejack National - a course he has designed near Houston. "I'm extremely disappointed not going to Bluejack, but I'm very excited about our grand opening in the spring," he said. "It's a fantastic course and we're very proud of our first US design." Woods, who had a small disc fragment pinching his nerve removed last month, missed the cut at three of the four majors this year. The American has not won a major since the 2008 US Open and has struggled with form and injury in recent years.